Some times, spare and simple fill the bill. 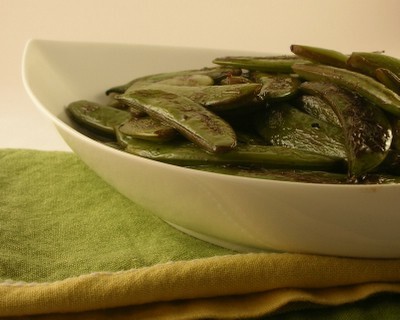 And that's the only way to describe these sugar snap peas, cooked in 10 minutes flat. NUTRITION NOTES Low Cal. Low Carb. Perfect for continuing post-holiday penance. The really good thing, if you have the hungries, is that sugar snap peas really have to be chewed, one by one. NEXT TIME These were good but not as memorable as these Sugar Snap Peas with Lemon. Heat the oil in a skillet til shimmery. Add the peas and toss well to evenly coat with oil. Stirring occasionally, cook the peas until cooked through but still bright green. Add the sesame oil and stir once or twice, then the soy sauce and vinegar. Cook til liquid dissolves. Season with salt and pepper. oooo....sounds great. :) I'm back blogging, btw...same place. These sound so yummy! I love sugar snaps! Harmonia ~ Welcome back, m'dear! Lady ~ Yummy sugar snaps, indeed!